As you may already have noticed, spoken English and written English are different in that you don’t really speak the way you write. In written English, you have plenty of time of constructing well thought-through sentences, whereas when you speak, you have to produce INSTANT speech, which, when put on paper, will seem a bit chaotic. And here’s a typical example. Imagine you have to explain some concept, for example – how the Internet works. Did you notice anything weird about it? The word IS is being repeated twice which may seem incorrect at first, but the fact of the matter is that it’s totally acceptable in spoken English, it’s used as an intensifier and is also known as the double copula. Just read that sentence out loud and pause at the comma – you’ll feel that it’s actually necessary to repeat the word IS! Also, if you look at the way the sentence starts, you’d think it’s a question – I mean, it’s the questions that would typically start with words such as WHAT and WHY, right? 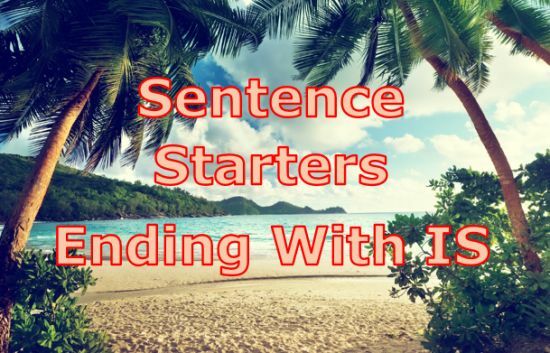 It’s about time you learned that spoken English allows you to use words differently and in this article I’m going to show you really handy ways of starting sentences when you have to provide an explanation of some sorts. And please bear in mind that I’m not telling you to use these spoken English grammar structures just for the sake of it. Now I’ve exhausted the list of my conversational English sentence starters starting with WHAT and WHY and ending with IS, and what I’m left with is – (by the way, did you notice I just used another one of those type of phrases?) – phrases simply ending with the word IS. Now, this concludes today’s article, and I would urge you not just stop here. USE the phrases from this article – it’s the ONLY way you can benefit from reading it! Thanks Zako, I’m glad you find them useful!